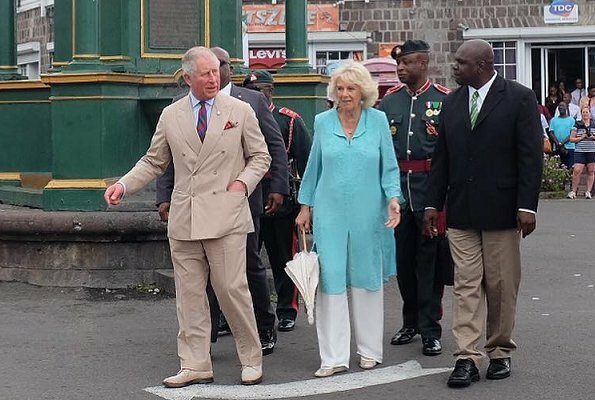 On March 21, The Prince of Wales and The Duchess of Cornwall visited St Kitts and Nevis. On arrival, The Duke and The Duchess were greeted by Sir Tapley Seaton, Govenor-General, and Prime Minister Timothy Harris. The Duke and Duchess visited National Museum, housed in the city’s Old Treasury Building. 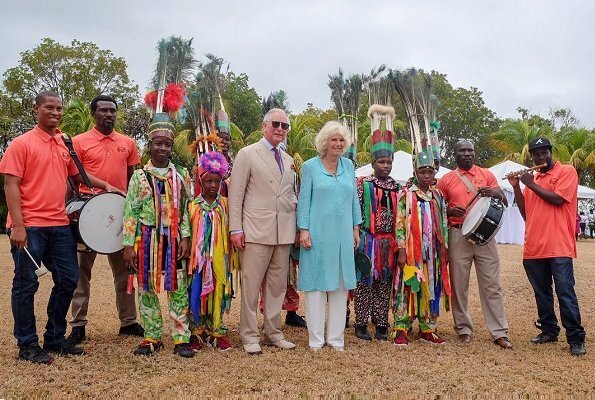 The Duchess of Cornwall meanwhile visited Hermitage Plantation House to meet local women, view an arts and craft display and learn more about life on the island. 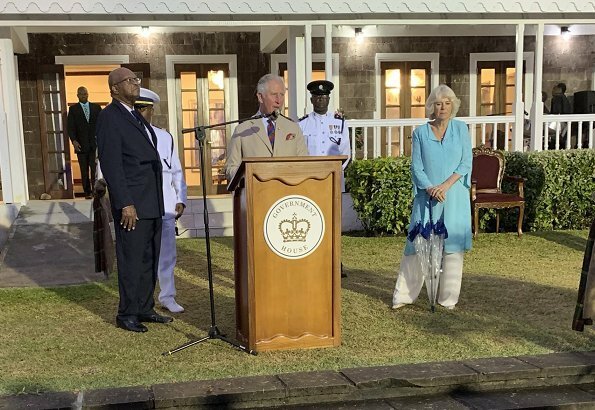 In the evening, Prince Charles and The Duchess attended a reception hosted by the Governor-General. 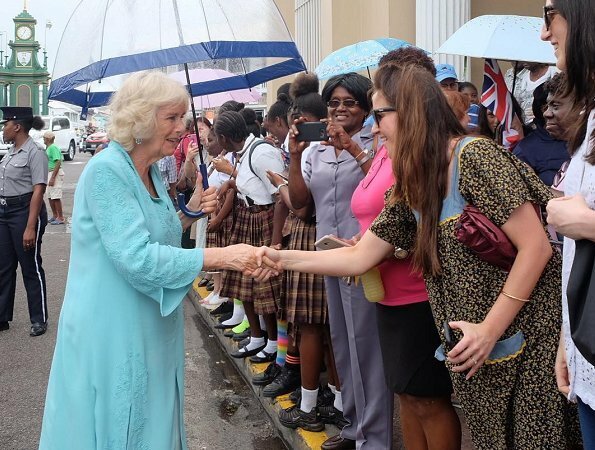 The Duke and The Duchess of Cornwall are visiting a number countries as part of their Caribbean Tour. Rather tacky for her 'no show' socks to be seen. There are ones that would have actually been 'no show' (have several pair myself) and his shoes were stained. I've looked and looked and can see no stains whatsoever on "his" shoes. As for the little socks they are barely visible and when she was standing and walking not seen at all. You must have superb vision. Thanks for the comments... We all have our own perceptions and I voiced mine, not towards the couple, but towards the shoes. Thanks for your comments as well and yes, my vision is really good. :) Have a great day. I understood that your comments were about what they had on their feet. I'm still none the wiser about these stains - where are they? I honestly can't see them. Duty and fun. This couple knows how to do both. 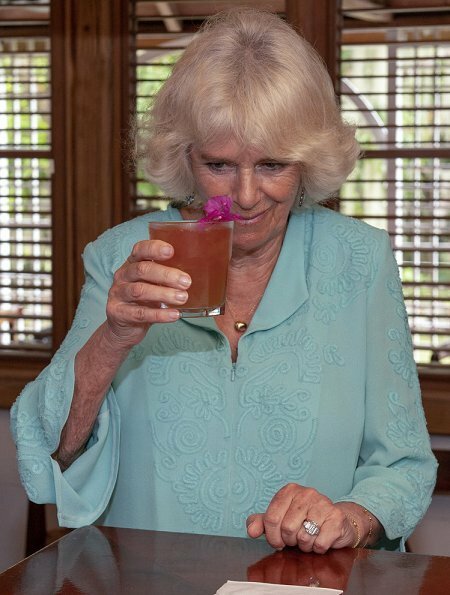 This is a long 12 day visit to several countries.Camilla looks very nice in these craftan's. Quel duc ? Il y a ici un prince et une duchesse. Lovely - she looks cool but elegant. Ilove this shade of blue on her. Agree. She really suits this shade of blue. 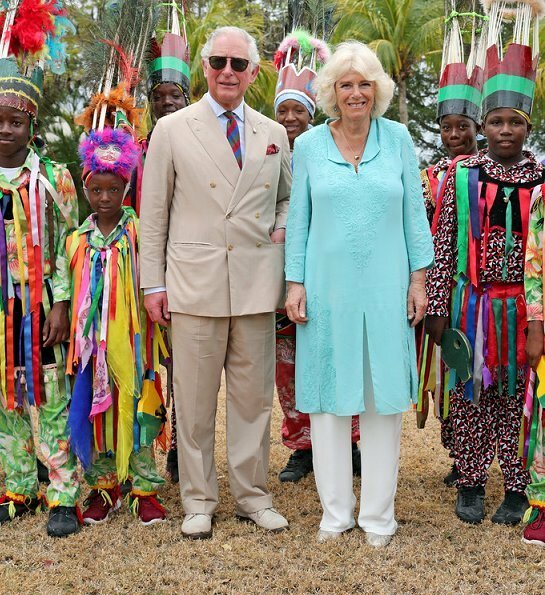 I do think, as someone said on a previous post, that the repeated choice of kaftans and trousers is a bit odd. It's not like visiting countries in the middle east where cultural sensitivities require that most of the female body is covered. And she has great legs for a woman of her age. 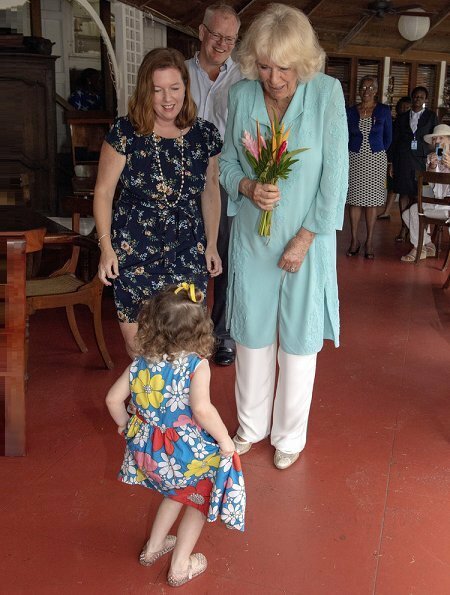 Isn't the picture of the little girl curtsying just fantastic, with the lady beside the Duchess obviously showing her what to do? I don't think that it's just cultural sensitivities. 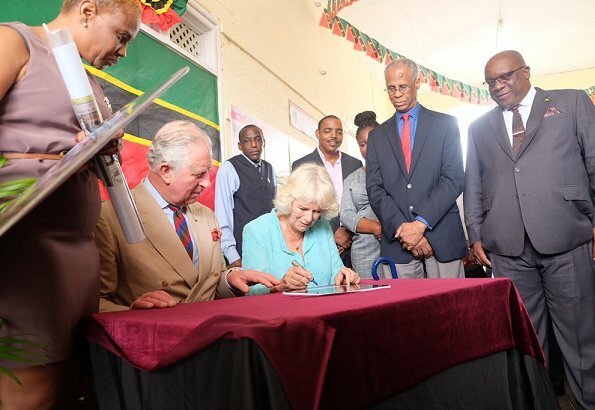 I think it may be obvious from the number of times we have seen her clutching a parasol (or perhaps I even read it somewhere) that Camilla's skin is very sensitive to the sun, requiring her to always cover up in warm countries close to the equator where the sun is the hottest. She is rarely seen in anything sleeveless or skin-baring when outdoors - at home or abroad. I know many people with skin sensitivities to the sun just like this, and they always have to make sure they are covered up or else move about in the shade. 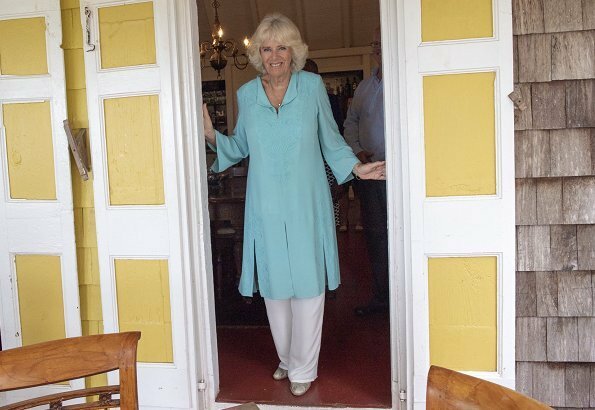 This may mean that she wears lots of light weight and light coloured tunics and flared trousers in such circumstances, but since she looks good in that style and wears it well, and her clothes always fit perfectly, I've no problem with that. 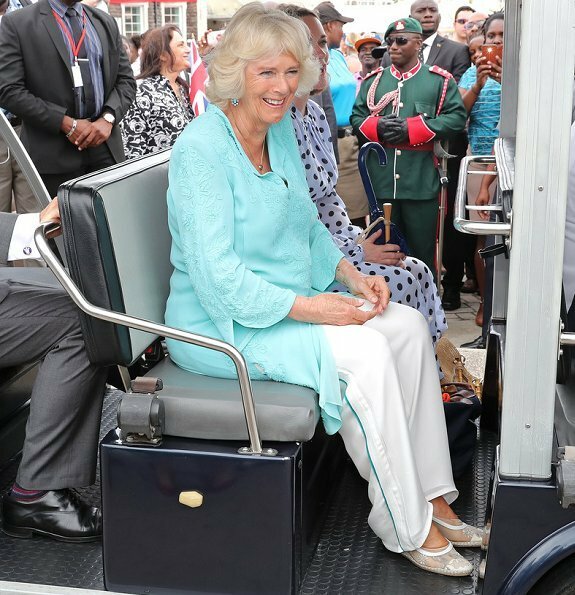 Like Duchess Camillas clothing choice very much.The details, the ornaments on the caftan and the earrings a special. It is extremly hot in the caribian and if you cover up yourself there is no chance to do without “sun..“. 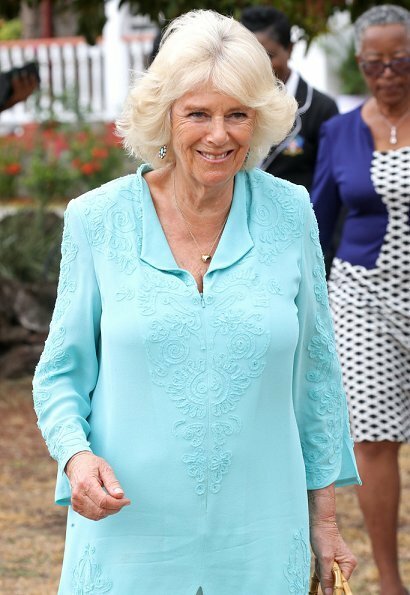 Ik vind Camilla prachtig, steeds mooie outfits en Charles is ook knap met dit lichte pak. 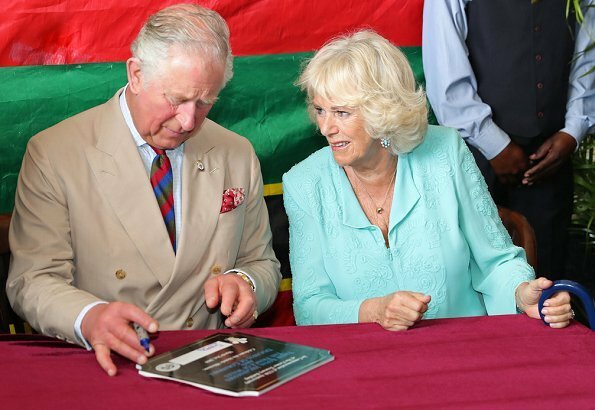 I find that Charles is dressed perfectly and Camilla outfit has a lot of wrinkles. I like her caftans anyways, they are a very good option for her age.